Home | Practice Areas | Social Security | Why Was My Disability Claim Denied? The Social Security and Supplemental Security Income disability programs provide financial assistance to individuals with disabilities that prevent them from working. These two federal programs differ in many ways, but the Social Security Administration (SSA) administers both. Only those individuals with a disability and who meet specific medical criteria are eligible for benefits under the two programs. Social Security Disability Insurance (SSDI) provides benefits to you and members of your family if you have worked for a specific period and paid the adequate level of social security taxes to qualify. Supplemental Security Income (SSI) provides benefits based exclusively on an individual’s financial need. The SSA provides a definition of disability that you must meet to be eligible for either program. You can use the SSA’s Benefits Eligibility Screening Tool to research which program may be the best for you. What Is My Chance of Being Approved for My Disability Claim? If I Am Denied, Who Can I Contact to Find out Why? Why Does It Make Sense to Hire a Lawyer to Help Me With My SSDI Benefits Claim? Your chances at first are not very good. 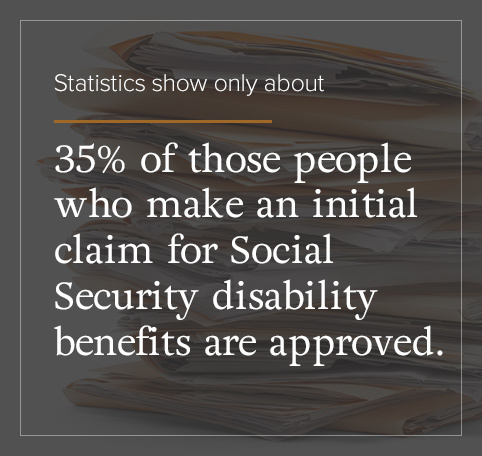 Statistics show of those people who make an initial claim for Social Security disability benefits only 35% are approved. Many people who are genuinely injured and submit an SSDI claim assume they will automatically get an acceptance. After all, if you have a real injury and qualify for disability benefits, why should you not get the benefits you deserve? Unfortunately, many people are denied benefits — even when they are qualified for them. There are many reasons for this, some of which have absolutely nothing to do with the individual. For instance, where you live and who looks at your initial claim may have a great deal to do with it being accepted or denied. The acceptance rates for Social Security disability claims vary widely from state to state, sometimes even between cities or between different Social Security offices. The reality is that the system is not quite as objective as the SSA might say it is. While the rules about how to determine whether a claim is valid or not remain the same nationally, the decision about each claim is made by a person who brings their own biases and subjective opinions to the process. This results in a process that is unavoidably subjective, even if the people making the decision do their best to be fair. The good news is, however, that even if your initial claim is denied, your chances of success improve the further along you will go in the appeal process. Do not give up hope if your initial SSDI claim is denied. A Social Security disability claim can be denied for several reasons. Remember, the decision about whether to grant your initial claim is a somewhat subjective process. So a claim that might be denied in one state would be considered eligible in another state, depending upon the state and who is doing the reviewing. It is especially important to submit all your sources of medical treatment, from the time of your disability or injury. This list should include the names of treating physicians, dates of treatment and contact information for where the treatment occurred. Also, you need to be sure to read the application and submit all requested information, double-checking for accuracy and completeness. While every effort is made to review each application correctly, mistakes sometimes do happen. Therefore an appeal should include all relevant information — even if it means you re-send some information. Have you submitted to all the tests required for your condition? Have you gone to your doctor each time you encountered a new symptom or challenge? Have you asked your doctor to complete a residual functional capacity (RFC) form? All these steps can ensure there is adequate documentation of your condition. For example, your doctor may be treating you for severe leg pain, but if your doctor has not accurately documented the treatment that you have been receiving and how that leg injury affects your ability to work, there is a high probability that your claim for disability will be denied. Many individuals who are applying for Social Security disability benefits make this mistake, especially if they are going through the claims process on their own without the help of an experienced Social Security disability benefits lawyer. People mistakenly believe that filing a new claim is preferable to appealing one that has been denied. While the appeals process might seem long and daunting, your chances for a successful appeal of a denied claim are much better than filing a new claim after your first one has been denied. In some cases, the person reviewing your new claim will automatically deny it when they see that your first claim was denied. It is always preferable to stay the course and work on an appeal rather than submitting a new claim. This only applies to SSDI benefits. If you are earning more than $850 a month and you apply for SSDI benefits, it’s highly likely that your claim will be denied. Why? The SSA will not give disability money to people they believe can work, despite the disability. If your doctor says that you must take certain medicines or follow a particular regimen of physical therapy, and you do not follow their advice, it is not very likely that your claim will be granted. The person deciding your case will have a hard time deciding if your condition prevents you from being able to work if you are not following the treatments that your doctor has prescribed for you. There are some acceptable excuses for not following treatment, such as suffering from mental illness so severe that you cannot follow any prescribed treatment or therapy, or you physically cannot comply because of your injuries. Nonmedical excuses include not having enough money to pay for the treatment or holding religious beliefs that prohibit the prescribed therapy. But you will need to have documentation to prove these conditions exist. Even if you do not like the people you are dealing with at the SSA, it does not matter. They are the ones who get to decide your initial claim. That is why it makes sense for you to cooperate with them through the application process as much as possible. Make sure you provide them with all the documentation they request and do not skip any medical appointments that they make for you. Stay in touch with the person who is handling your case at the SSA office, and respond promptly to all the requests. To qualify for Social Security disability benefits, the SSA needs you to prove that your disability is serious enough that it will leave you unable to work for at least a year or that it will result in your death. The SSA will only make exceptions to this 12-month duration requirement if the applicant is blind. For instance, if you are in a motorcycle accident and break several bones, it is not likely that you will be able to collect Social Security disability benefits. Most bone breaks heal within 12 months. Only if you can document that your fractures have not healed after six months will the SSA consider your disability to be serious. Your condition must also cause you severe limitations if you want to qualify for SSDI benefits. The SSA needs to be able to communicate with you regularly about the status of your application. If the local SSA office or the person dealing with your application cannot find you to schedule essential exams, request documents or ask for clarification on submitted paperwork, it is not likely that your claim is going to be approved. This is another good reason why hiring an experienced SSDI benefits attorney is a good idea. If you name them as your representative, they can communicate with the SSA. It is up to you, however, to stay in touch with your attorney so they can contact you when they have relevant information for you. If you are addicted to alcohol or drugs, and these behaviors become contributing factors to your disability, there is a good chance that your claim will be denied. The person at the SSA evaluating your initial claim and the medical consultant they work with have to consider whether you would still be disabled if you are not using drugs or alcohol. The reality is, in most cases, they will use alcoholism or drug addiction as an excuse to deny your claim. The SSA will look very hard on your claim if you are in prison or have been convicted of a felony. For instance, if you injure yourself while committing a felony and were convicted, the injury you suffered or a previous injury you aggravated cannot be used as reasons for applying for SSDI benefits. When it comes to fraud, the SSA will end your benefits and prosecute you if it discovers that you have been receiving SSDI benefits based on fraudulent means. If the SSA denies your first claim for benefits, you will receive a notice of denial. It will include a summary of your medical condition, the injuries, and limitations that they considered, and all medical or nonmedical documentation that they viewed, as well as an explanation for why they denied your claim. Many denials will include an explanation known as a “technical rationale” which provide you with a complete explanation of the medical issues that played a part in the denial. If you received a notice of denial, but it did not include a technical rationale, you or your attorney can request your files from the SSA so you can examine it. If you have not already done so, hire an experienced SSDI benefits lawyer to help you prepare your appeal. 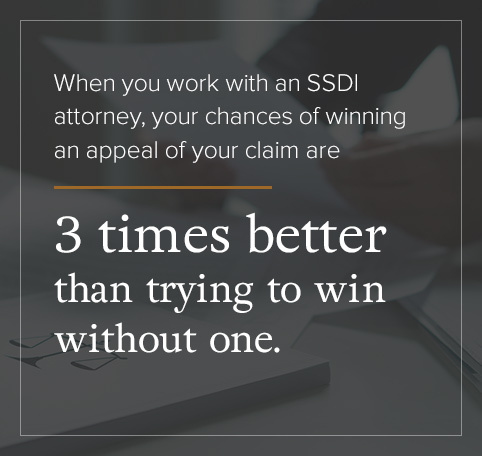 When you work with an SSDI attorney, your chances of winning an appeal of your claim are three times better than trying to win without one. Time is of the essence. You only have 60 days from the day you received notice that your claim has been denied to file an appeal. The first step is to file a request for reconsideration. This step means that another SSA representative will look over the file that you have already submitted. You can add new information or change some of the information you have already submitted to more accurately reflect the situation. Chances are, however, that you will also be denied at this step. The next step, perhaps the most important one, is to appeal for a disability hearing. At the hearing, an Administrative Law Judge (ALJ) will hear your explanation of why you think you deserve SSDI benefits. You can bring witnesses if you so choose, but make sure you consult with your attorney first on whether witnesses are a good idea. You can also introduce any new evidence or developments in your medical condition that have taken place since you filed your initial claim. If you are patient, you have a much greater chance of success in a disability hearing. Statistics show that roughly 62 percent of those who appeal to an ALJ through a disability hearing will receive benefits. Many people who receive notice that their initial claim has been denied hesitate to hire a lawyer to help them appeal because they worry the process will cost too much money. In fact, all Social Security disability lawyers work only on a contingency basis. They only get paid if you get paid. Any lawyer you hire to work with you on your appeal will receive either 25 percent of your payment or $6,000, whichever is less. For example, if you received $10,000 in disability benefits on appeal, your lawyer’s share would be $2,500. Remember, you are three times more likely to win your appeal when you work with an experienced SSDI benefits claim lawyer than you would if you did not. Your attorney can also help make sure that your case is properly prepared, all your medical documentation is up-to-date and accurate and that all your paperwork is filed on time and in the right place. This is a tremendous benefit if your disability prevents you from being able to do even mundane tasks or travel. Your attorney does all the heavy lifting for you with your cooperation. If you are dealing with a denied social security disability claim, contact KBG Injury Law for a prompt, thorough consultation. Our attorneys focus on SSI and social security disability claims, and we would be happy to review your situation. You can call us at 1-800-509-1011 or contact us online where you can leave us your contact details and some information about your case, and a member of our team will get back to you as soon as possible.